Howdy friends! It’s Andy Gesner and the staff from HIP Video Promo, here to share a pair of clips from a freshly-minted soul combo with a classic approach. Now, usually we’re quick to write that we’re excited to help spread the word about new bands and new videos. And we’d love to say the same for Black Joe Lewis & the Honeybears, but the news about the fiery eight-piece R&B group has been traveling so fast, we’re not sure there’s anybody left to convert. Lewis and his band were the talk of this year’s South By Southwest Festival, they’ve been written up in Filter, Esquire, and the Washington Post, and they’ve got the full imprimatur of Austin’s rock royalty: they’ve toured with Okkervil River and Spoon. Britt Daniel loves them, and Spoon drummer Jim Eno produced Tell ‘Em What Your Name Is, their full-length debut. They’re the hottest act to emerge from the Texas capital in years; the nation is on notice. And if you’re one of the uninitiated, you’d be hard pressed to miss them in the coming months when they tour with the New York Dolls, and make stops at the Chicago Blue Festival, Lallapalooza, Bumbershoot and Austin City Limits Festivals. How have they done it? An incendiary stage show – one guaranteed to get even the most jaded hipster dancing – has certainly helped. The Black Joe Lewis recordings are every bit as audacious as their gigs: swaggering, funky, sweaty, electrifying, primal, wholly believable. Almost all modern musicians are influenced by The Godfather of Soul; these guys actually sound like James Brown and his legendary band. Lewis is the possessor of a legit Stax-style soul scream – which he puts to good use during the climactic moments of the simmering “I’m Broke” and the hip-swiveling “Sugarfoot”. The Honeybears have shared the stage with Little Richard; longtime fans of the rock and roll originator were thrilled to hear a young group with such an authentic sound. 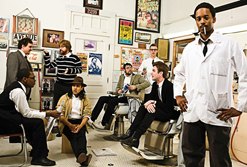 At the same time, Black Joe Lewis & the Honeybears are a resolutely modern act. Lewis’s subject matter might be timeless (women, cars, money problems), but the language he uses will be familiar to anybody exposed to recent urban music. He’s not a throwback; he’s an American city dweller who happens to love vintage R&B records. Lewis and his band look like Austinite musicians: they’re young, handsome, energetic and videogenic, and primed for the spotlight. Director Daniel “Turkey” Gibbs has helped craft a visual aesthetic for the band that emphasizes their deep roots in rock history while showcasing their good looks and contemporary appeal. Consider, for instance, the band’s clever spot for “Sugarfoot”, their latest single. Black Joe Lewis & the Honeybears are captured in performance – they’re set up like a soul-revival act, but they play their song with garage-punk intensity. Gibbs switches between sepia- and blue-toned lighting meant to make the footage look archival and direct illumination that suggests the present moment. Better still, he freezes the action frequently, and drops in title captions for each musician that look like cover art for old Motown or Blue Note 45s; every member of the Ho neybears (including the horn section) is so introduced. We’ve also included the clip for the band’s pugnacious “I’m Broke” – and here, Gibbs takes the “Sugarfoot” approach even further. Here, through use of a blue-screen, the band appears to be playing inside artwork that evokes the sixties and seventies. They bring the past to life and make it feel current and relevant; they nod to their sources; they demonstrate the eternal quality of original R&B. Classic soul fans and Stax-Volt enthusiasts (and aren’t we all? ), you’ve found your new heroes. We’re all very excited to be working with the good folks at Lost Highway Records to bring you these dynamic clips. If you need more info, call Andy Gesner at 732-613-1779 or e-mail us at HIPVideo@aol.com. You can also visitwww.LostHighwayRecords.com or www.BlackJoeLewis.com to find out more about Black Joe Lewis & The Honeybears.